Friends First has two options, and both types of mentoring are effective ways to improve a young person’s life. The key ingredient that makes mentoring work is the formation of a genuine friendship between the mentor and the child. The information below is designed to help you select an option that works best for you. A cool way to learn your way around Chicago! Community-based mentors pick up their mentees from home. The children in Friends First live in various neighborhoods throughout the city. Our boys campus in the West Loop is the site! We pick up the children, and site-based mentors will meet their mentee on campus. The children in Friends First live in various neighborhoods throughout the city. 1 Year (8 hours per month). Community-based mentors agree to spend a minimum of 4 hours every other week with their mentee. The match goes a full 12-month cycle. Weekend availability is preferred. School-calendar (9 months). Site-based mentors agree to spend a minimum of 5 hours every other weekend with their mentee. This is done on Saturdays only. Mentors decide with their mentee, the best day/time for them to meet for an outing. If you have a rigorous or unpredictable schedule, this is a good option. Enjoy the luxury of a regular and predictable schedule! Friends First will provide a calendar of session dates. A good option if you like having a set time and place to meet. Also a good option if you are taking public transportation. We are a low-cost/no-cost program, but volunteers may purchase lunch or pay any costs associated with outings. Lunch is provided for every session, as well as costs associated with group outings. Plan activities with your mentee! Community-based mentors decide what to do during the time spent with their mentee, or allow the mentee to select the location of an outing. There is no shortage of things to do in our big city! The site-based program provides a combination of on-site activities and off-site outings. On alternating Saturdays, mentors will decide what to do with their mentee for the day. There is no shortage of things to do in our big city! Our volunteer selection process includes a personal interview, criminal background check, medical exam, reference feedback, and record of driving history (if applicable). 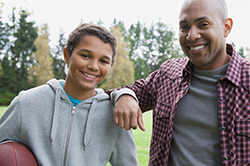 Community-based mentors must have full clearance before being matched with a child. You do not have to have a car to be a mentor. Our volunteer selection process includes a personal interview, criminal background check, medical exam, reference feedback, and record of driving history (if applicable). Site-based mentors must have full clearance before being matched with a child. You do not have to have a car to be a mentor. Mentors will meet or speak with their assigned Match Support Representative (“MSR”) on a regular basis. This allows our program to give and receive feedback about the match. Mentors receive on-site support from their assigned Match Support Representative (“MSR”). Staff is available during each session to give and receive feedback about the match.